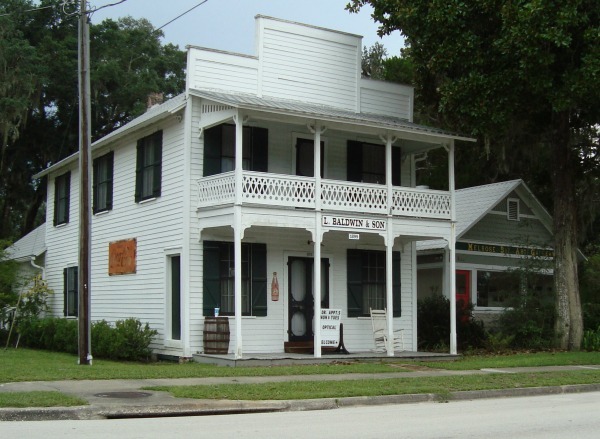 Melrose, Florida is a quiet little Victorian village about halfway between Gainesville and Jacksonville at the intersection of State Roads 26 and 21. State Road 26 is a historic road. 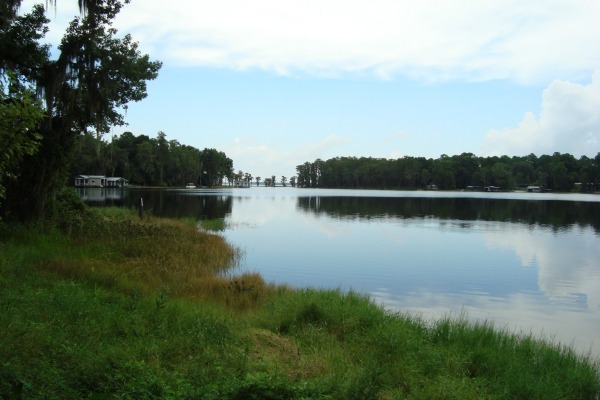 It was the first federal highway built in Florida and it was completed while Florida was still a territory in 1824. It was known then as Bellamy Road and connected St. Augustine to Pensacola. When I was a student at the University of Florida, some of the staff and faculty lived in Melrose and made the drive each work day. They valued the laid back quiet ambiance of the place. That hasn't changed in the many years since I graduated. The town takes its name from Melrose Abbey in Scotland. 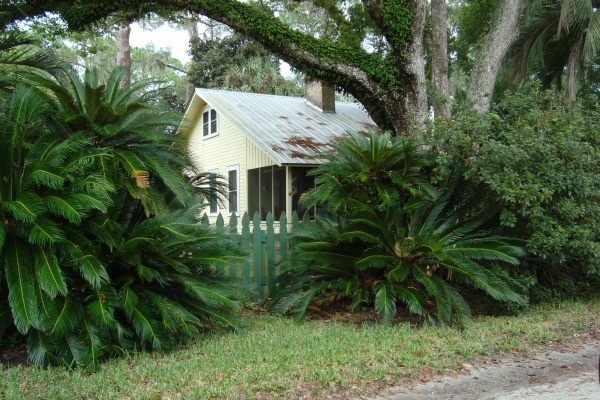 The town originally existed to serve the booming citrus industry that was becoming quickly dominant in this region of north Florida. 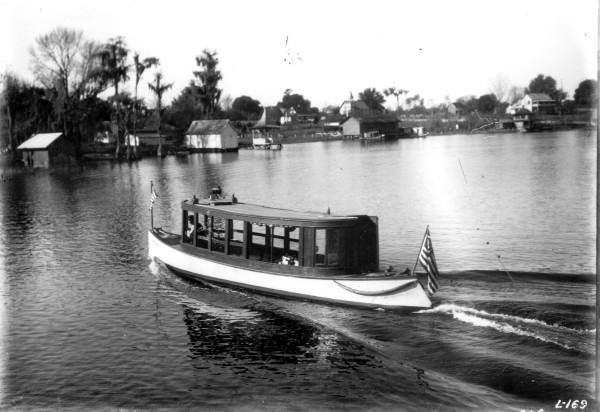 Melrose is at the southern end of Lake Santa Fe, and a canal was dug from the lake to Lake Alto and then to Waldo, the nearest point on the railroad at the time. From Waldo, citrus from Melrose and the surrounding region made it's way to northern markets on the railroad. The giant freezes of 1894 and 1895 wiped out the citrus industry. Local groves were destroyed, and most of the citrus growers relocated further south in Florida. Melrose has survived in the years that followed as a quiet unincorporated residential community of about 3500 people. Many artists and writers are attracted to the town because of its quiet beauty. The rustic streets, many of them unpaved, are canopied by ancient oaks draped with Spanish moss. It is a quiet inviting atmosphere. One of my favorite writers, the late Al Burt, retired here many years ago. He wrote such Florida classics as "Becalmed In The Mullet Latitudes", "Al Burt's Florida" and "The Tropic of Cracker". The famous rock and roll pioneer Bo Diddley lived for many years on a farm near Hawthorne, south of Melrose. 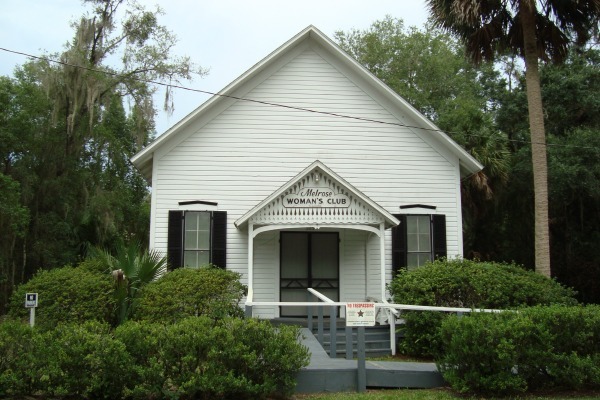 The musical legend is buried in Bronson, Florida, and has a major downtown square in Gainesville named after him. 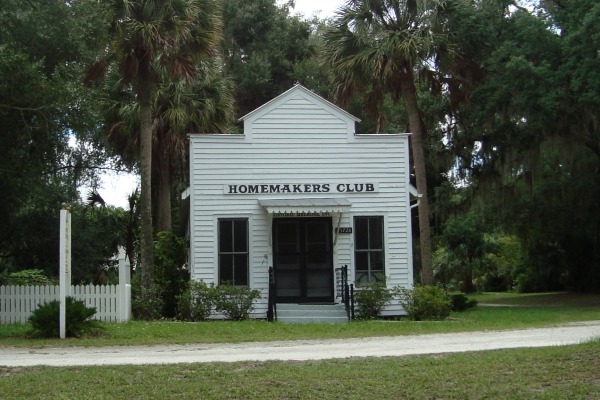 There are 72 structures listed in the Melrose Historic District. The District is on the National Register of Historic Places. 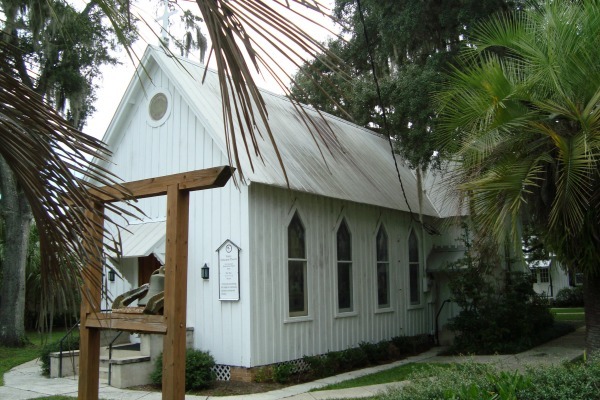 Among the structures is Trinity Episcopal Church, an example of Carpenter Gothic architecture. The church is at 204 State Road 26. Trinity was completed in 1886, and built completely using local materials. Blue Water Bay is not only popular with local residents, visitors come from miles around to enjoy the atmosphere and great food. 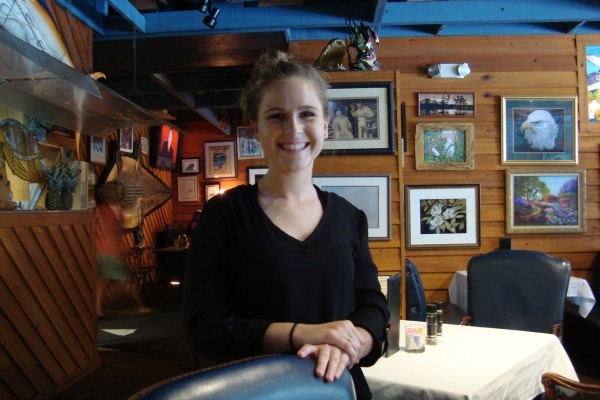 I visited recently and was impressed with the extensive menu, full service bar, and friendly efficient staff. The ambiance of the place is Old Florida with a lot of original paintings on the walls, some of the by local artists and for sale at reasonable prices. The lunch menu features numerous choices of appetizers, soup, sandwiches, entrees, pasta dishes, wraps, and Cajun specialities. This is a long way from Louisiana Cajun country, but their spicy choices are great. The dinner menu is even more extensive. I chose Seafood Gumbo from the Cajun menu featuring Cajun Crawfish Etouffe, Veggie Gumbo, Grilled Chicken Gumbo and Cuban Mojo Pork. My meal was excellent, and I led it off with a giant Bloody Mary from the bar. My only regret was that I was too full to enjoy a second meal. The dinner menu is a larger version of the lunch menu, and you can also order from it at lunch is you choose to. The appetizer list is extensive, including Smoked Duck Quesadilla, Fried Cajun Marinated Turkey Breast, oysters, gator tail, escargot, jumbo crawfish, ahi tuna and on and on. 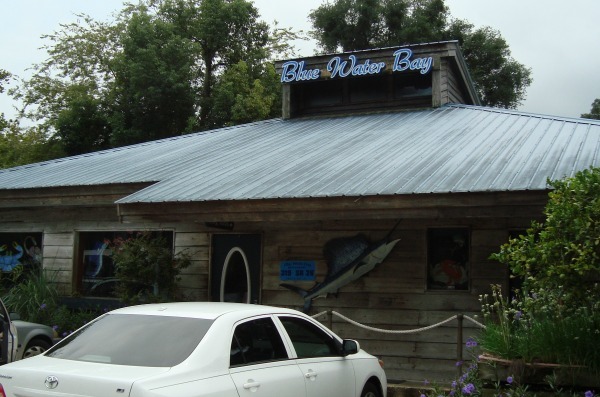 Bluewater Bay is noted for its seafood and the entree menu includes fried shrimp, Alaskan snow crab legs, fresh Florida Fighting Gator Tail, oysters, and fresh seafood and herb pasta, and the fresh catch of the day. Landlubbers are not forgotten, either, with an 8 ounce Ribeye Steak and Herb Marinated Grilled Chicken Breast. Desserts featured include sour orange pie, key lime pie, carrot cake and a host of other goodies. A popular feature at this restaurant is the Gourmet Buffet on Friday and Saturday nights. It's so popular that reservations are advised. The Sunday Brunch is also very popular and served every Sunday from 1000 am to 300 pm. This brunch features Quiches and Salads, Crepes, Benedicts, and fanatastic A La Carte and House Specialties. The full service bar has everything you could want, and the restaurant also has an extensive wine list. Blue Water Bay is open 7 days a week from 1100am to 900pm except on Saturday when it stays open until 1000pm.